Before your trip, double-check the schedule. Sometimes digs are cancelled with little notice if the Department of Health detects toxins or other issues with the shellfish population. Clammers should double-check the Department of Fish and Wildlife schedule before a trip. How many clams can you dig? 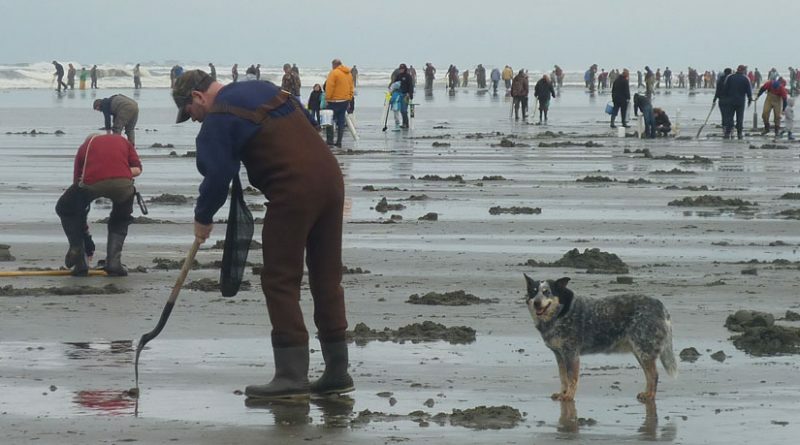 State law allows clam diggers to keep 15 clams. They must be the first 15 dug which means clammers may not throw back clams that are too small or that they cut through while digging. Each person’s clams must be kept in a separate container, this makes it easier for law enforcement to ensure each person is obeying the 15 clam limit. Do you need a license to go clam digging? Yes. Interested diggers can purchase licenses online at https://fishhunt.dfw.wa.gov. If you need it sooner than 10 days you must go in person to a licensing vendor. Ace Hardware is the only vendor inside Ocean Shores and tends to get very busy during clam digs. Clammers should try to buy a license before arriving. Find more license vendors here: http://wdfw.wa.gov/licensing/vendors. Most importantly you will need something to dig with and something to store your clams in. Clam diggers also need to prepare for the weather which will probably be wet, cold, and windy. A clam shovel is a long and narrow shovel. This enables you to dig a deep hole quickly before the clam has a chance to escape. A clam gun is a cylinder pipe made typically from plastic/PVC or metal. You shove the clam gun down into the sand over the clam and pull it back out. There is a small hole on the clam gun that lets the air escape when you shove it down into the sand. When lifting the clam gun up you plug that hole when you pull it out. This causes a suction force that pulls the sand up when you lift up. Is it cheating? Maybe. Does it work? Absolutely! And your shovel using friends will be jealous. Each clam digger is required by law to store their clams in their own container. This allows law enforcement to ensure each person is not exceeding their limit. Due to this nets are popular options. A clam net is simply a strong, typically nylon, net mesh material that can be easily carried or clipped to a belt. Depending on the weather it is often very cold and windy on the beach in Ocean Shores. 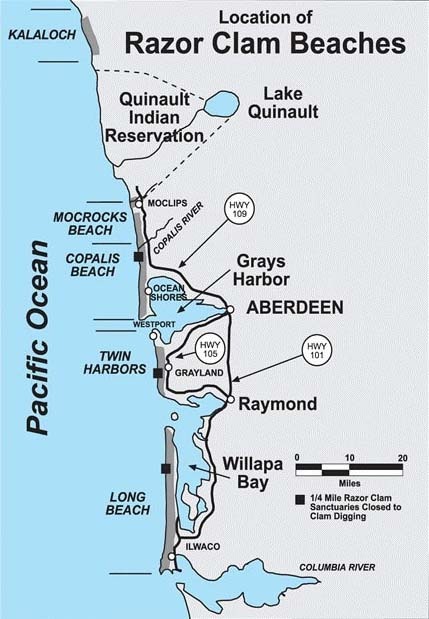 You should check the forecast and understand the unique Ocean Shores climate which usually calls for layering warm clothing and rain gear. If you have good waterproof boots you should wear them. Hip waders are even better. How do you dig for clams?